Successfully Added Teclast X22 Air All-In-One PC - 21.5 Inch FHD Display, Intel Celeron CPU, 4GB RAM, Intel HD Graphics, HDMI, SPDIF, WLAN, USB 3.0 to your Shopping Cart. The Teclast X22 Air is an all-in-one PC with a huge 21.5-inch screen and all the latest features at an affordable price. With its beautiful compact design and stylish stand this powerful monitor PC will attract a lot of attention with its solid visual offerings and speedy performance. 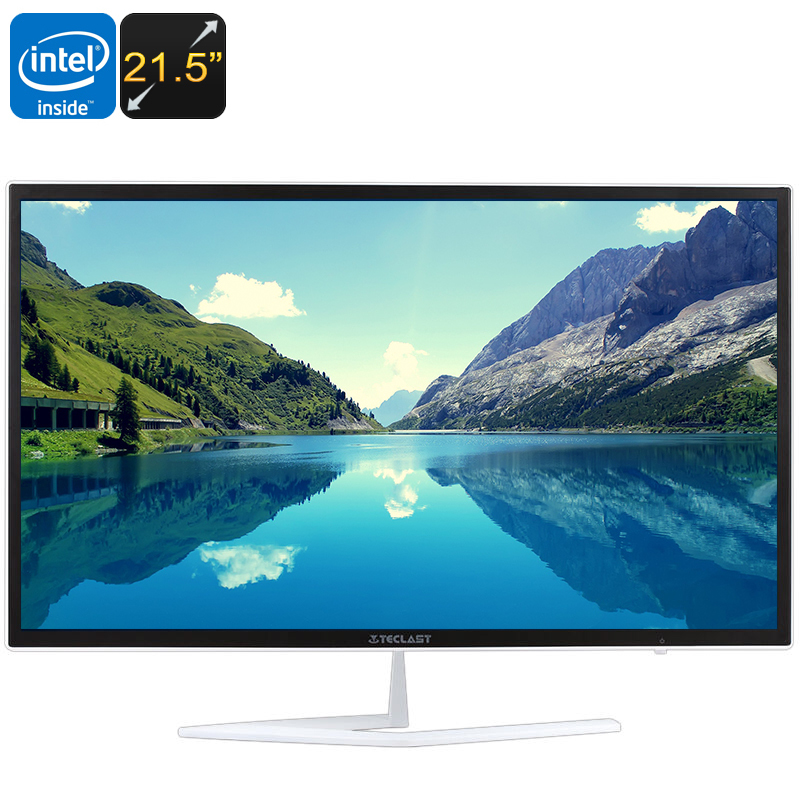 This cool PC is a full HD flat screen monitor that integrates with a state of the art Intel Celeron processor along with Intel graphics, 4GB of RAM and 128GB of SSD storage. All this is plenty for running the Windows OS, watching media content, doing work, and surfing the web. The 4GB of DDR3L RAM can be expanded up to 16GB of RAM if you want to enjoy some high impact gaming and the 128GB, fast access, SSD hard drive will be plenty to suit most needs. When it comes to visuals the large 21.5-inch screen brings a 16:9 aspect ratio and 178-degree viewing angles, which is ideally suited to movie content and at 1920x1080 you'll find there's plenty of detail. Whether you're watching movies, surfing the web, or multitasking the Teclast X22 Air will be sure to impress. An HDMI output on the side of the screen lets you connect to a second display and supports 2K outputs, so you can expand the desktop with a high definition monitor or projector screen - a perfect way to give presentations or enjoy a movie with the family. There are also three USB 2.0, two USB 3.0, DC in and 3.5mm audio jack so you can easily hook up peripherals such as controllers, keyboards, and audio devices. Wireless network connectivity lets you position this computer anywhere in your home without needing extra wires and the slim, compact design ensure it will easily fit on just about any sideboard or desk without taking up much room. The Teclast X22 Air all-in-one PC comes with 12 months warranty, brought to you by the leader in electronic devices as well as wholesale PCs and tablets.. This product has a basic DOS OS system, you need to install any other system yourself. As a wholesaler, we provide no software support, advice, or training regarding the operating system and software.